For comprehensive resources about BEL (Brain Emotional Learning) and BEL-based AI models, visit BELresearch.org. This study suggests a new prediction model for chaotic time series inspired by the brain emotional learning of mammals. We describe the structure and function of this model, which is referred to as BELPM (Brain Emotional Learning- Based Prediction Model). 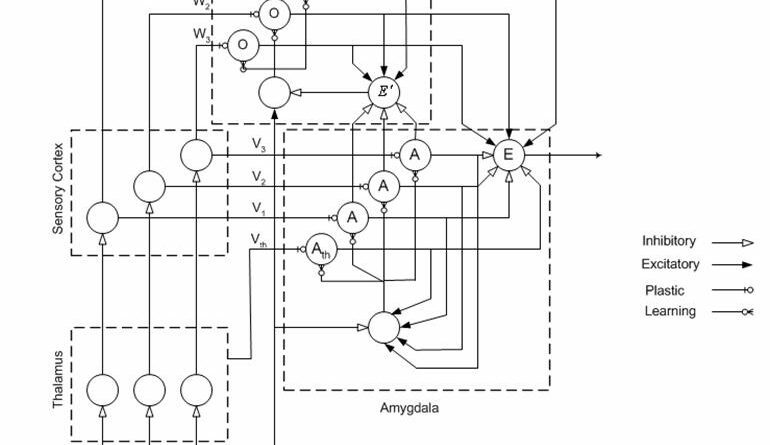 Structurally, the model mimics the connection between the regions of the limbic system, and functionally it uses weighted k nearest neighbors to imitate the roles of those regions. The learning algorithm of BELPM is defined using steepest descent (SD) and the least square estimator (LSE). Two benchmark chaotic time series, Lorenz and Henon, have been used to evaluate the performance of BELPM. The obtained results have been compared with those of other prediction methods. The results show that BELPM has the capability to achieve a reasonable accuracy for long-term prediction of chaotic time series, using a limited amount of training data and a reasonably low computational time. The past few years have witnessed a proliferation of industrial and decision making applications of a novel neurocontroller designated as BELBIC: Brain Emotional Learning Based Intelligent Controller. Based on a proposed open loop descriptive model of the midbrain, where emotional processing is understood to mainly take place, its utilization has been motivated by the belief that most human decisions are made using bounded rationality. Successful control engineering and decision-making applications are reviewed, where BEL has been used for satisficing action selection based on artificial emotions. Laboratory and Industrial scale applications are emphasized. Recent results on stability and performance guarantees are also examined. Finally, flexible bioinspired SOC and other hardware/software implementations of BELBIC are investigated. It is argued that in order for VLSI implementations of neural networks to be commercially viable, it is crucial to minimize the redesign expenses for their optimal dedicated implementations for any given application on any desired platform. Furthermore, online applications require recursive learning that need not precede the recall mode. High levels of adaptability, disturbance rejection, and fault tolerance are other important characteristics of the proposed IC. Classification is an important task of machine intelligence in the field of information. The artificial neural network (ANN) is widely used for classification. However, the traditional ANN shows slow training speed, and it is hard to meet the real-time requirement for large-scale applications. In this paper, an improved brain-inspired emotional learning (BEL) algorithm is proposed for fast classification. The BEL algorithm was put forward to mimic the high speed of the emotional learning mechanism in the mammalian brain, which has the superior features of fast learning and low computational complexity. To improve the accuracy of BEL in classification, the genetic algorithm (GA) is adopted for optimally tuning the weights and biases of the amygdala and orbitofrontal cortex in the BEL neural network. The combinational algorithm named as GA-BEL has been tested on eight University of California at Irvine (UCI) datasets and two well-known databases (Japanese Female Facial Expression, Cohn–Kanade). The comparisons of experiments indicate that the proposed GA-BEL is more accurate than the original BEL algorithm, and it is much faster than the traditional algorithm.